Breeze-M is a liquid-propellant, Russian, rocket upper stage. The ILS Proton Breeze-M, with a length of 2.61 meters and diameter of 4 meters, was captured on camera from the ground. The rocket stage, international designation number 2009-042B, was at an altitude of 17674.109km, elevation 45.167° and azimuth 164.443°. The images were taken from Surprise, Arizona, at a distance of 19099.402 km from the target. A Celestron NexStar 6SE, MaxView40 lens and adapter, and Sony CX500V HD HandyCam were used to track and image the object. A Samsung SCB-2000 served as the tracking camera and SLA-550DA CCD as the camera lens. The object was near the lower edge of the lens, so its lower portion may have been distorted, or it may indeed have been damaged. The image here represents the best single frame taken from the HD video recorded internally on the Sony CX500V. 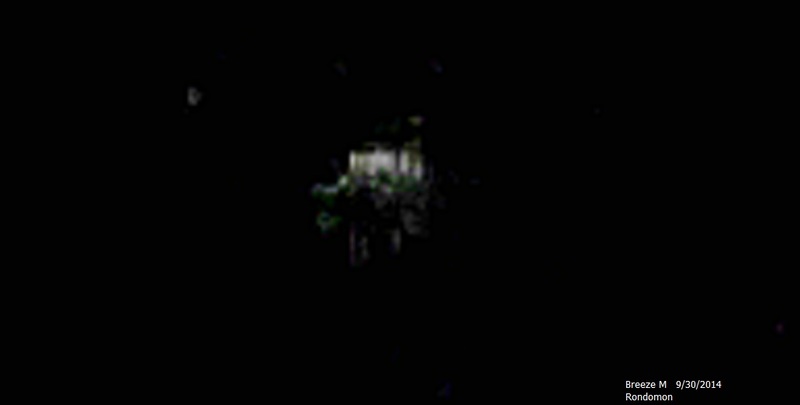 The camera was set at an optical zoom of about 5X, low lux and NightShot (infrared) were enabled.